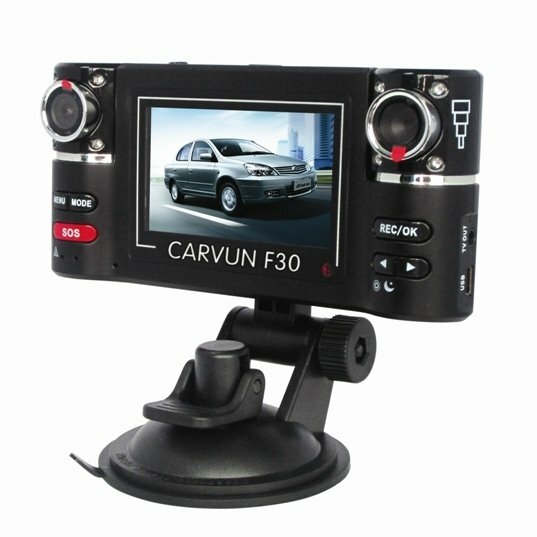 HD auto camera - Carvun F30 with Dual Lens, which means two separate lenses sensing movement in a vehicle or on the road. You can buy online at our store. 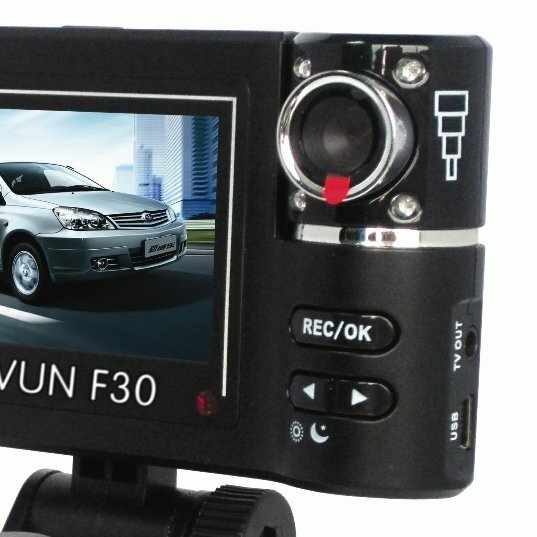 HD auto camera - Carvun F30 with Dual Lens, which means two separate lenses sensing movement in a vehicle or on the road. So you can rotate lens as you need. The front lens always captures movement in front of your vehicle. Maximum video resolution of (1 channel lens) is 1280x 480 pixels and 30 frames per second (2 channel lens) has a resolution 640 x 480 pixels at 30 frames per second. The left lens has angle of view up to 120 ° degree and the right lens has telescopic angle of view and it can be telescopically set up. Both lenses can be rotated up to 180 degrees. The camera has an output in the form of TV OUT, so can be connected via the AV cables to the display device. 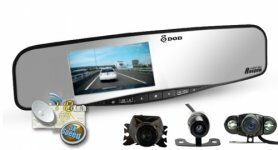 Great HD auto camera, especially designed for the record of car ride. The media call this thing "car black box." What can the camera do? Motion detection allows to start recording automatically when it detects any movement. The footage is automatically saved on micro SD card. 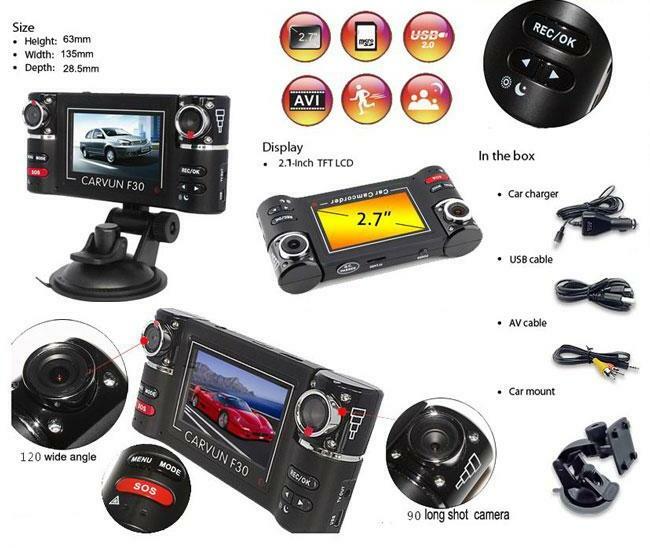 Car camera supports memory cards with capacity of up to 32 GB. It can be connected to PC via USB. 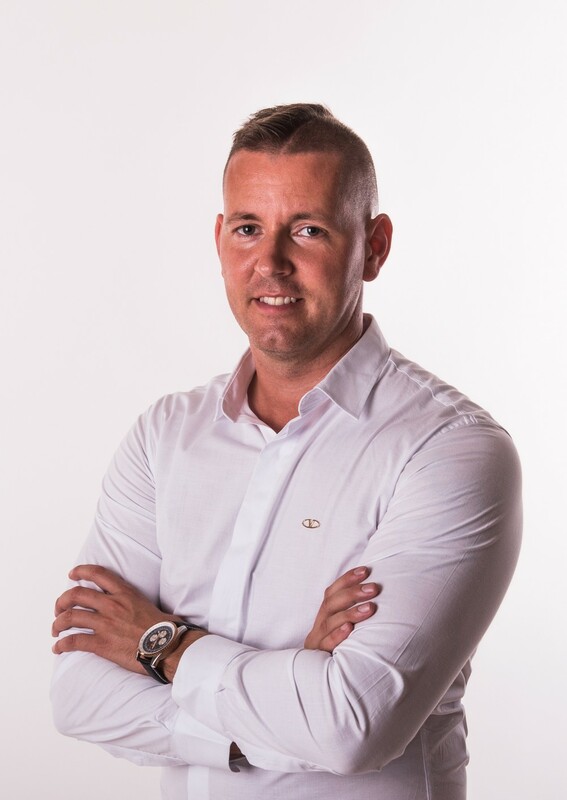 The camera has a speaker and a 2.7 "inch LCD display through which you can see what you are recording, you can view videos and photos that you have made and you can easy set up everything you need, from the video quality to date and time. It disposes with powerful 8 night IR LEDs which you can easily capture drive in night. And finally, the best! 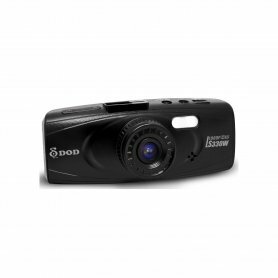 With this camera, you don´t need to worry that your card is full and you can not catch som special moment. It has a cyclic recording, which means that in automatic mode records videos in a row with a lenght of 2, 5 or 15 minutes (depending on your settings) - a total lenght of up to a few hours and when your card is full, the oldest section is automatically deleted and a new one is recorded . 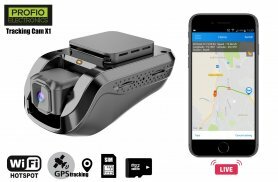 So you can record nonstop without changing of card or manually delete videos, and you can always be sure that if any special situation will become on the road, you will have it recorded! The camera also has an SOS button, which allows to keep some chosen footages on the SD card, so these files will not be overwritten by new ones. But the most important thing is, that when the camera is connected into a car lighter, it turns on automatically and starts recording. What does this mean in practice? Imagine, that you would have to turn on the camera manually everytime you get into a car. But you don´t have to. It automatically turns on when you start the car and starts cyclic recording of your ride. 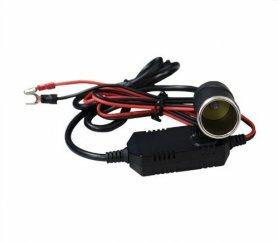 In fact, everything you need to do is to fix the camera on the glass, connect it into a car lighter and that´s it. The package contains positionable holder on glass and car charger. 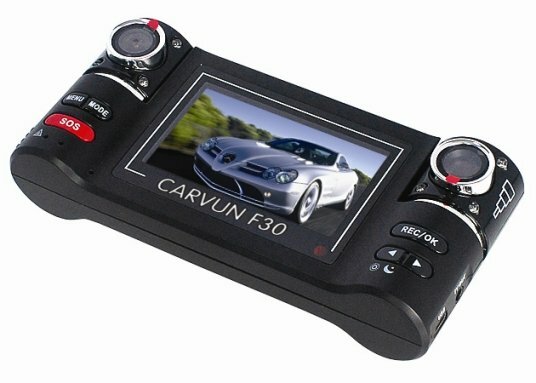 The camera has a built-in Li-ion battery, so you can record even without starting the engine of the car.